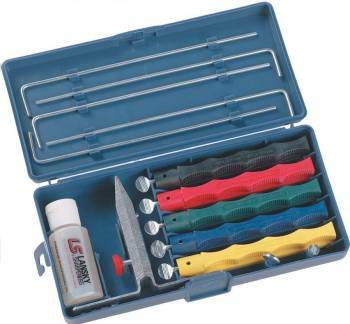 Professional knife sharpening kit, Includes extra coarse hone, coarse hone, medium hone, fine hone, and ultra fine hone. Comes with precision multi-angle, flip-over knife clamp, sharpening hones on color coded finger grooved safety holders, one guide rod for each stone, specially formulated honing oil, and extra long knife clamp screws. Custom molded storage/carrying case. Includes easy to follow instructions.